Shown at the Winter Meeting of the Great Lakes and Great Rivers Section are, left to right, (standing) John Stuart, Section Meetings chairman; Edwin A. Rosson, author; Ian Sharp, Section Papers chairman; Richard Jacobs II, Section chairman, and John Colletti, Section vice chairman, Great Rivers; (seated) authors Allen R.
Dujenski, Robert Latorre, and Frederick Ashcroft. 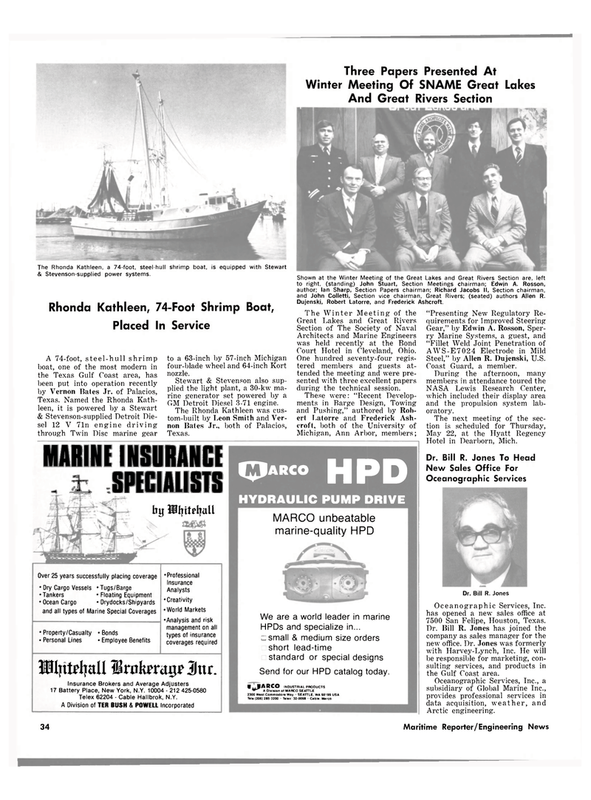 The Rhonda Kathleen, a 74-foot, steel-hull shrimp boat, is equipped with Stewart & Stevenson-supplied power systems. Over 25 years successfully placing coverage • Dry Cargo Vessels • Tugs/Barge •Tankers • Floating Equipment • Ocean Cargo • Drydocks/Shipyards and all types of Marine Special Coverages • Property/Casualty • Bonds • Personal Lines • Employee Benefits to a 63-inch by 57-inch Michigan four-blade wheel and 64-inch Kort nozzle. GM Detroit Diesel 3-71 engine. Court Hotel in Cleveland, Ohio. One hundred seventy-four regis- tered members and guests at- tended the meeting and were pre- sented with three excellent papers during the technical session. Steel," by Allen R. Dujenski, U.S.
NASA Lewis Research Center, which included their display area and the propulsion system lab- oratory. Oceanographic Services, Inc. has opened a new sales office at 7500 San Felipe, Houston, Texas. Dr. Bill R. Jones has joined the company as sales manager for the new office. Dr. Jones was formerly with Harvey-Lynch, Inc. He will be responsible for marketing, con- sulting services, and products in the Gulf Coast area. Telex 62204 - Cable Hallbrok, N.Y. Send for our HPD catalog today.